Surrounded by Cognac vineyards and fields of sunflowers discover La Rose des Vents - a former 19th century Cognac Domaine - an elegant Manor House and two beautifully restored, spacious 3 bed properties - in the heart of the peaceful and picturesque Charente Maritime region of South West France. The Domaine hidden from view, on the edge of a sleepy hamlet, is just 5 minutes from the busy market town of Matha, 15 minutes from Cognac, and within easy reach of the Atlantic beaches, La Rochelle and the chic Il de Re in the Charente Maritime. 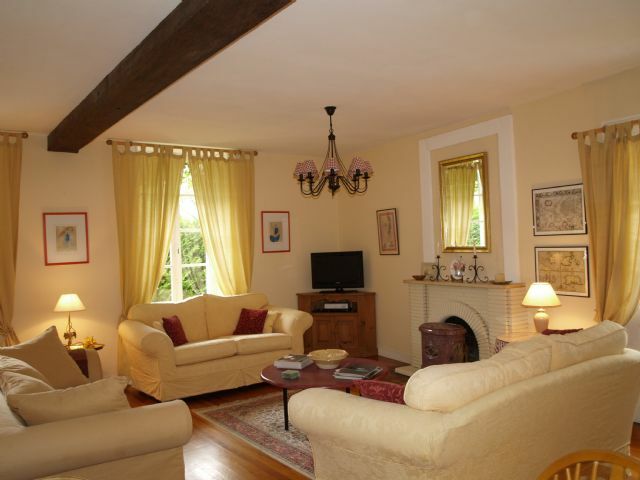 Relax in Manor Cottage, a traditional Charentais house or Rose Cottage the former stables, set discretely within the 2.5 acre gated grounds. Both spacious properties are decorated in a pleasing mix of English and French country style. Period details such as waxed and terracotta floors, aged beams and sky blue shutters are combined with quality furnishings and linens, ensuite bathrooms and equipped with 21st century facilities including good WIFI, to provide a comfortable and luxurious stay. Each cottage sleeps 6 (+ cot) has been awarded a 4 star classification by the French Tourist Office, and selected as one of Sawday's Special Places to Stay. Each property has its' own private flower filled walled gardens equipped for outdoor dining, assuring total privacy and tranquillity, and there is an 11 x 5.5 metre heated swimming pool (for sole use of guests) set within the fruit orchard overlooking the vineyards. The resident owners, have owned classic sports cars for over 25 years, and included in your self catering stay is a complimentary tour through the vineyards in a 4 seater Morgan sports car. Classic and sports car owners will find everything supplied – from pool towels to picnic hampers, secure covered parking, the use of a garage and tools and a programme of scenic drives to take you off the beaten track through vineyards and picturesque countryside to unspoilt villages in the Charente, Charente Maritime,Dordogne and Bordeaux regions. If you are touring France in your classic car, ask about our luxury B & B, Chambre d'hote in the Manor House. 7 day inclusive touring itineraries can also be organised for groups of Classic Car Owners, including the famous Circuit des Remparts held in Angouleme each year. Additional accommodation is available for larger groups.